NG, Hoi Ying (2018) Learn, Play and Connect - The New Experiential Library @Singapore Sports Hub. Paper presented at: IFLA WLIC 2018 – Kuala Lumpur, Malaysia – Transform Libraries, Transform Societies in Session 153 - Poster Session. 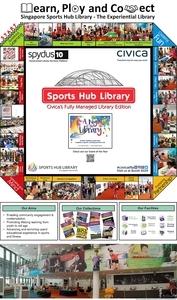 The Sports Hub Library, a specialized public library located within the Singapore Sports Hub, was opened in July 2014. The Library supports the Singapore Government’s Sports Master Plan - “Vision 2030: Live Better through Sports” where everyone can experience sports and entertainment in a community that celebrates diversity and inclusion. 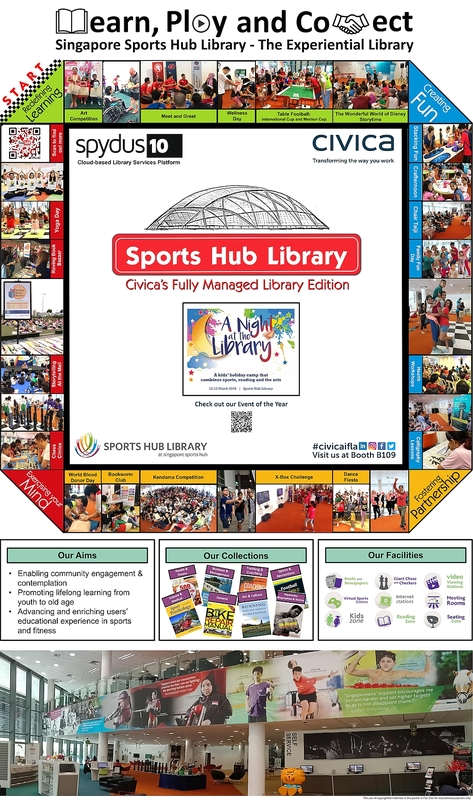 The poster illustrates how ‘Learn, Play, Connect’ underscores the design of the Sports Hub Library to support the sports fraternity and sports enthusiasts through various ways. “Learn” – In addition to providing access to a wide range of print and electronic resources, the library conducts more than 1000 free programmes and activities such as workshops, talks, seminars and exhibitions, etc. a year to educate and promote healthy living. “Play” – To support active recreation, facilities including Xbox, Giant chess/checkers, Subbuteo are always in high demand; activities such as lunchtime yoga, Zumba, meditation sessions and competitions such as Kendama, Sports Stacking, chess are regularly organized. “Connect” – The library is the go-to “community” space for members, sports associations, sports meetings, “meet and greet” sport celebrities sessions, sports-themed book launches and storytelling sessions for the young.